Can we all agree that life is much better with pets around? Cats, dogs, birds, and any other animal you’ve got are essential additions to any family, which is why it’s no surprise that people want to take their furry friends everywhere with them. Luckily, a lot of Las Vegas neighborhoods and businesses also feel this way because, for the most part, the city is very pet-friendly. If you are trying to decide the best neighborhood for you and your pet to hang out in, Neighborhoods.com has you covered. 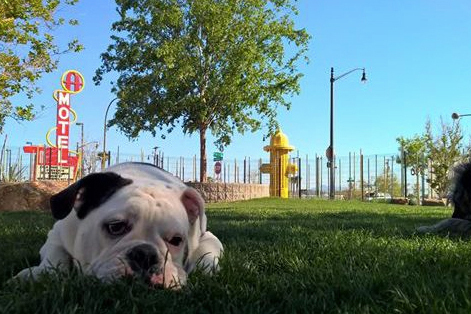 Here’s a roundup of some pet-friendly neighborhoods in the Vegas Valley. In the city of Las Vegas, there are over 100 hotels that welcome pets and many of them are on The Strip. This is perfect if you’re visiting, have visiting friends with pets, or if you want to take a staycation and bring your animals along. Some of the hotels include the Delano Las Vegas, The Bellagio, The Linq, Caesars Palace, The Cosmopolitan of Las Vegas, and The Venetian/The Palazzo. Check out Bring Fido to see a full list of the hotels in the city that allow pets. Restaurants on The Strip that allow pets on their patios include Café Americano and Grimaldi’s Pizzeria. At The Park, both Beerhaus and Bruxie allow dogs on their patio. Also, since The Park is an outdoor entertainment area, there are always people wandering around walking their pets and taking in all the space has to offer. Spring Valley is a broad, centrally located area of the city and has a lot of options for anyone who wants their pet around at all times. If you are going to dine out with your pets, there is Egg & I, Fatburger, Veggie House, and Eatt Gourmet Bistro. If you want to grab a cup of coffee with your pet, you can do so at The Madhouse Coffee, and if you want to have a drink — or six — with your dog, you can at Crown and Anchor British Pub. If you’re looking for a dog park, there are a few in Spring Valley. 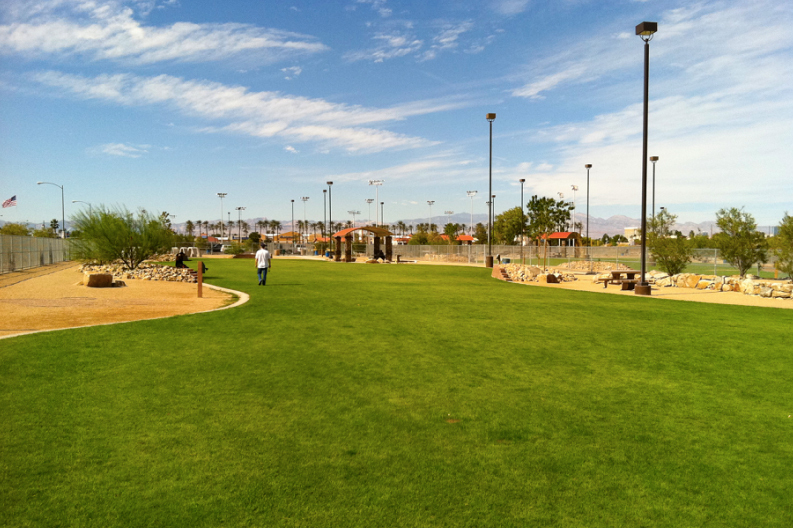 Desert Breeze Park is one of the largest and most popular parks in the city, and it has a dog park area. Desert Breeze is also where Pet-A-Palooza is located every year. Pet-A-Palooza is a massive outdoor concert and food festival where pets of all kind are welcome — dogs, cats, snakes, rabbits, turtles, etc. — and at this event, pets are available for adoption. Other dog parks in the area are Spring Valley State Park and Charlie Frias Park. If you love your pet so much that you are considering getting them a friend, you can head over to the Las Vegas Valley Humane Society, which is also in the Spring Valley neighborhood. You can also go through them to foster pets, find a lost pet, and spay or neuter a pet. Green Valley is an upscale area in Henderson, Nevada with a lot of choices for someone who wants to include animals in their everyday activities. The District at Green Valley Ranch is located minutes from the Green Valley neighborhood. Not only is it one of the most popular shopping centers in town, but they love and cater to dogs there. 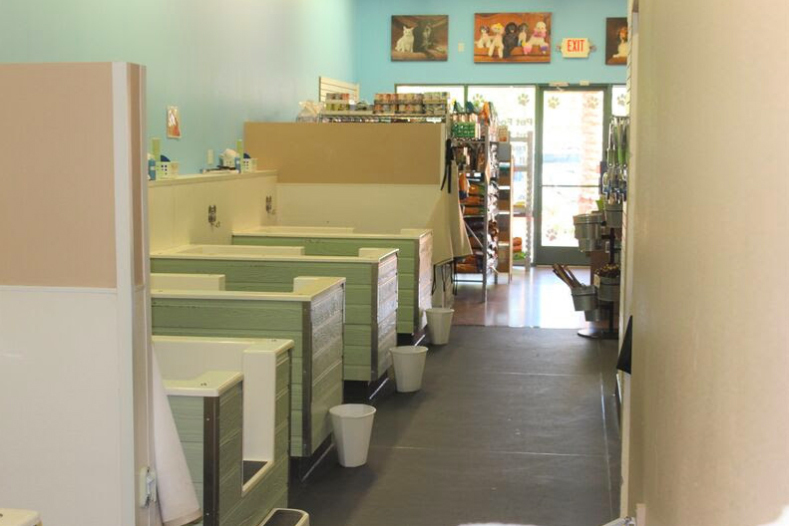 Dog Friendly mentions that every store has water and dog biscuits out front and most stores allow animals inside. Outdoor shopping center The District at Green Valley Ranch also has a pet photo night where your animals can take pics with Santa around the holidays. Name something cuter than that. There are a number of restaurants in the Henderson area that allow dogs on their patios, including Elephant Bar, Rachel’s Kitchen, CRAFTkitchen, and Genghis Grill. If you want to spoil your dog, you can take them to either Paseo Vista or Dos Escuelas Dog Park, or take them to The Soggy Dog and pamper them with a bath and toys. If your furry pal has a sweet tooth, take them to visit Woof Gang Bakery & Grooming or Hap-E-Dog Natural food & Bakery. 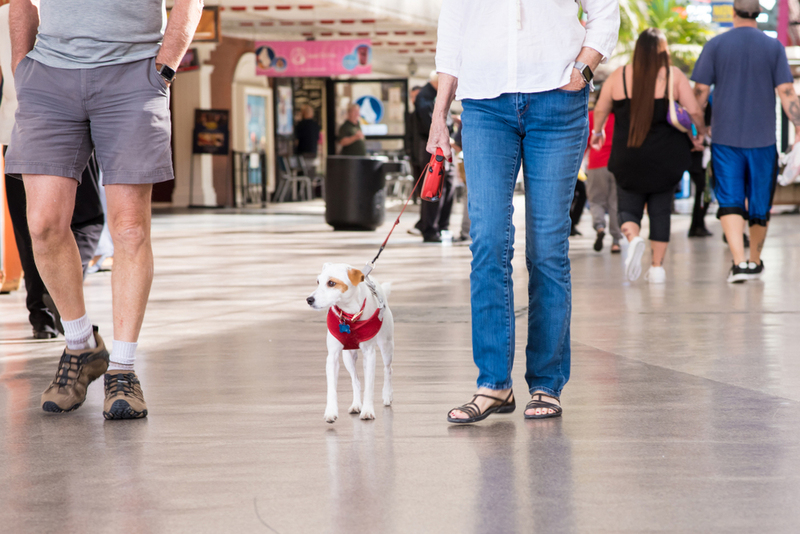 Downtown Las Vegas is very walkable as a whole, which makes it an ideal place to have dogs. If you are looking to get married in Vegas and need a unique location that also allows dogs — because why wouldn’t you — Chapel of the Flowers may be just the spot for you. They also allows cats to be part of weddings. Some downtown restaurant and bars that allow pets are Triple George Grill, Grape Vine Café, Park on Fremont, and at Maker & Finders Coffee. If you plan on staying downtown with your pet, consider Oasis at Gold Spike, Golden Nugget, or the City Center Motel.